Missing person was last seen in downtown Melbourne on New Haven Ave.
MELBOURNE, Fla. - After accidentally pocket dialling his father overnight Sunday a 21-year-old man was reported missing when the man's phone was later found without its owner. Melbourne police are searching for Matthew Robineau, who was last seen in the area of downtown Melbourne on New Haven Ave. Police said Robineau pocket-dialed his father Sunday around 2 a.m., and when his father tried to call him back, there was no answer. Robineau's mother told News 6 on Tuesday that ther's a $1,000 reward for information leading to her missing son. Police said Robineau's father used the "Find my iPhone" feature to track his son's phone to the area of Melbourne Causway. The phone was found along with some of Robineau's other personal belongings, according to a news release. 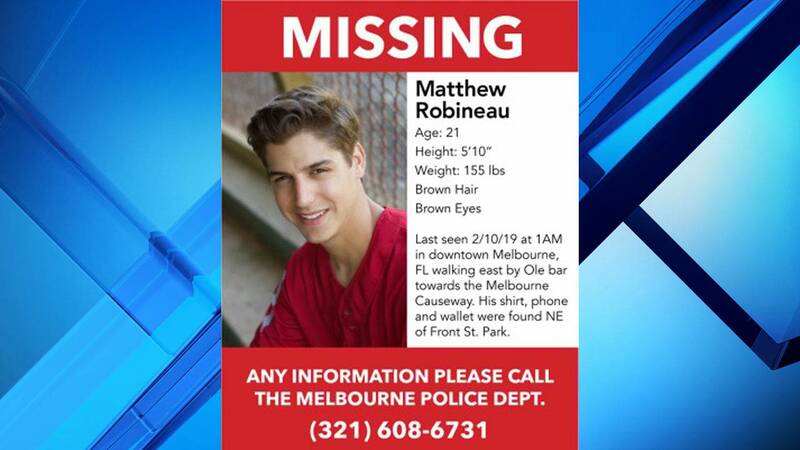 Matthew Robineau was last seen Feb. 10, 2019 in the area of Melbourne Causeway. The man's father said the man had been out Saturday night with friends in the area of downtown Melbourne and he was concerned for his safety. Police searched the area using canines and were unable to find the 21-year-old or where he may have gone. Later on Sunday, Robineau did not show up for work and was entered into the police database as a missing person. Police verified with several businesses on New Haven Avenue that Robineau was last seen walking east near the railroad tracks and was possibly intoxicated. A U.S. Coast Guard vessel searched the area near Melbourne Causeway with no result. Anyone with information about Robineau's whereabouts is asked call Detective Tom Cahalan at 321-608-6453.